Pine to Palm 100m, Here I Come! ...the Pine to Palm 100-Mile Endurance Run on Sept 14th! Yes, 20,000' of climbing goodness at the Oregon/California border, ending in my former hometown of Ashland, OR, all put on by the amazing team at Rogue Valley Runners. Plenty of blog-worthy photo ops for sure. My Dad has volunteered to crew, and I've got enough time to properly prepare. Looking forward to seeing you all there! 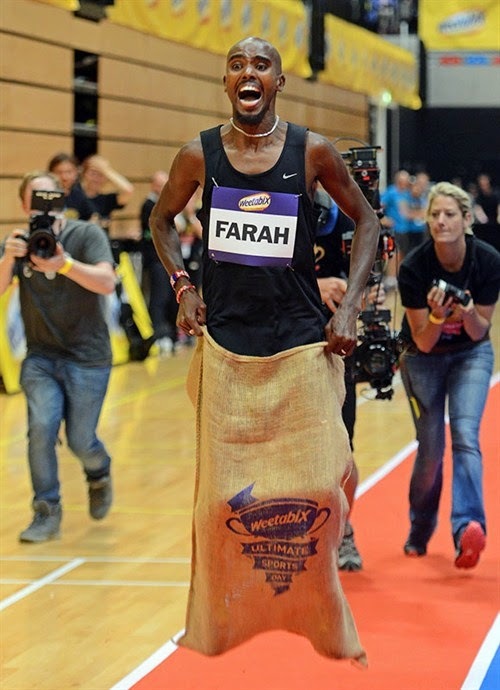 Olympic Double Gold-Medalist Mo Farah, more known for his 5k/10k prowess, finally got to add a world record to his resume....for the 100m potato sack race. Check the video here. His blazing speed of 39.91 seconds was good enough to get into the Guinness Book of World Records. Will Usain Bolt retaliate?!? I wonder how hard it would be to find a world record to go after. If I was 90 years old, I could just grab three friends and do a relay and instantly set an age group WR like these guys. Unrelated - a quick note to Big Sur Marathon fans - if you want to run in 2015, you better get over there and register. The process is different this year (some first come, first serve, some lottery) but it's showing as much craziness as last years 59-minute sell out. And if Comrades is on your agenda for next year, don't forget to wear your age group tag or you may be disqualified (and have to sue Comrades like Zola Budd). I start the year, and my calendar is totally blank. I'm committing to TRT100! Look at all that time to train! All that time to recover! I'm going to kill it! Then the family vacations get slotted in, and in the Dunlap clan, July is a heavy month. By the time March rolled around, we had booked the first half of July to see family in Portland, Eugene, Santa Barbara, Tahoe, and more. 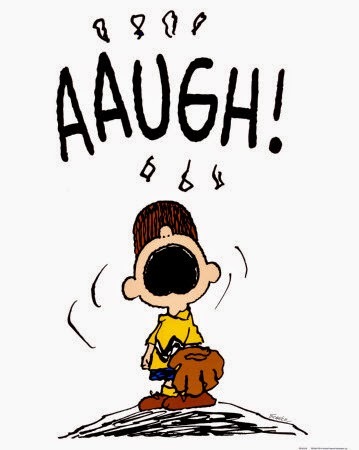 But it's vacation, right?!? I'll have plenty of time to train! Lots of time to rest!!! Well, not exactly. Family wants to see you (not see you run), the daily vacation schedule is stunningly full, kids get overwhelmed and don't sleep well (how many 4-hour sleep nights can Daddy do? 6, 7, 8...), lots of driving, lots more driving, and the few runs you can slot in are exhausted slogs. Next, work kicks in. I work at a high growth company, and it never ceases to amaze me how much can get out of whack when you miss a few days. Miss a few weeks, and it can turn into mayhem. Next thing you know, every vacation day has a call or a few hours of emails, and you find yourself cutting vacation short to take a red eye flight back to work a 70-hour week. Oh crap, that means I'll have to red eye flight back and drive six hours just to make the starting line for the TRT100! Then you get that tickle in your throat...that hack and sniffle that comes not from a virus, but from multiple days of pure exhaustion. It's the kind of cold you can't "tough out" and run for 24 hours anyway, for it quickly grows into a torturous, all-day-in-bed monster that can take out whole months of your season. Even downgrading to a shorter distance is a recipe for disaster. You gotta get healthy. You gotta DNS. So all my best to the TRT100 runners with better planning skills, especially my Inside Trail Racing teammates Bob Shebest (defending champion, now eyeing that Master's CR), Victor Ballesteros (the envy of all Strava runners this summer), Chris Eide, and Brenda Blinn. Go get 'em!